John B. Riley, Indian School Superintendent. This is a necessary cleansing, as I am standing in a wounded place. This is the Stewart Indian School, which existed from 1890 to 1980. All around me are native stone buildings from the late 19th century, classrooms, dorm rooms and dining hall, where Native children lived and went to school. The US Army rounded them up and brought them great distances away from family and tribe, to disconnect them from traditional ways and give them the skills to live in the new Euro American world. In these now boarded up buildings spirits moan in longing for the old ways and fading faces of family. I am participating in the annual summer field school offered by UNR to anthropology students to teach them the basic skills of field archaeology: how to lay out a site using math skills, and modern tools like GPS. In this arid desert land of less than five percent humidity and stark, burning sun, it is a challenge to stay hydrated. This is the eighth field school in which I have participated. Dr. Sarah Cowie is my friend and the site director. She patiently walks about the different places where we are digging, offering a dialectic of probing questions, helping the students reflect on where they are and what it is they see. This UNR field school is a partnership with the Nevada Indian Commission and the Washoe Tribal Historical Preservation Office. Archaeology has a history of plunder and deception toward Native culture. In the past, scholars have created personal trust relationships with tribal members in order to find out secrets about tribal traditions and possible locations for excavations. Bones of buried ancestors have been disinterred and placed in museums like the Smithsonian for public display. Only recently have there been amendments of these actions and return of the ancestral remains to their tribe. So you can understand that the relationship between native culture and the academics has been one of deep suspicion. Dr. Sarah Cowie, to me, is the perfect bridge to building new relationships of trust and respect. She brings years of experience working with tribes in Arizona and has a genuine sensitivity toward relationships with native peoples. During my visit, Sarah met with leaders of the Indian Commission, and the presence of ten native students in the class was an intentional effort to build bridges and empower these students with academic skills for further study of their heritage. The Stewart Indian School opened in 1890 with a federal mandate to educate Indian children so they could work in Euro American society. They learned household tasks, so they could work in homes, and trade skills like shoemaking, blacksmithing and plumbing. Speaking in their native tongue and practicing tribal traditions were forbidden to students. 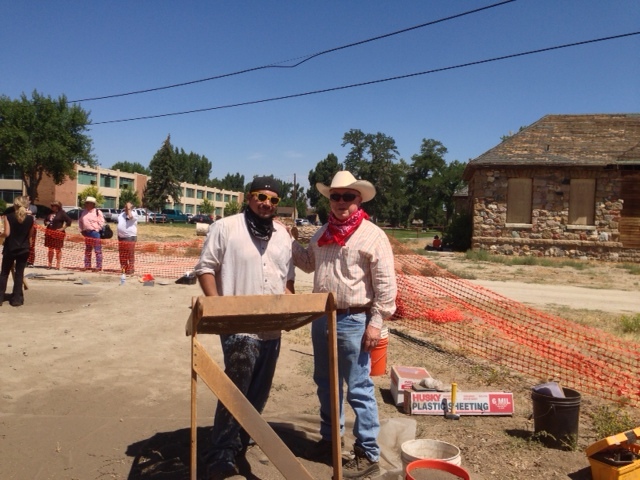 It was a new experience for me working closely with several Washoe Indian students in our area of the dig. We are on our knees together with trowels, scrapping the hard clay soil and screening the very dusty debris. My screening partner was Eric, whose grandmother was a student here. He said there were good as well as bad things that happened here. He said his grandmother had mostly good memories of friendship with other students and the teachers. Eric had friendly banter with me and the other students. I lift the orange bucket filled with dirt from our excavation pit. Very heavy. I pour it into the screen being held up by Eric and he shakes the screen into a huge cloud of dust. We both move around the remaining rocks and gravel on top of the screen, looking for anything unusual, about the size of my little finger: a piece of charcoal, some wood, or a shard of glass. This was once a one-room wooden schoolhouse from the 1870s. I see something tiny and square and lift it up. We look at it carefully. It is inscribed with strange designs. Eric thinks it is part of a bracelet, with tribal markings. He holds the item in the palm of his hand and sighs. What is he thinking and feeling? I hold a brown paper bag with our pit number and date. What we have found today will go to the lab at the University. There will be computer data and categorization. The Enlightenment mind of science labels these found items to create a composite of data to make hypothesis of the use and construction of this old wooden schoolhouse, which burned down in 1890. But this piece of tribal bracelet in Eric’s hand is sacred. Eric’s native tradition sees all of life as filled with spirit presence; even these pieces of rock are spirit charged, as they are in a place that is part of the tribal history. This experience changed my sense of presence in this place. In the past, archaeology removed valuable items, identified them, categorized them, and stored them away in dusty warehouses to be available for future research. But every item we touch today in this place is sacred and spirit charged. Most of my experience with native culture has been with the Owens Valley Paiute. I asked Eric if the Washoe people were part of the Northern Paiute and boy did he correct me. “Our people were here before the Paiute came. Our language is not Numic. We are not Paiute.” I reflected with him about all the social service programs that had been created by the Bishop Paiute Tribe, a good use of casino money. He said he had an old girlfriend who lived in Bishop and that place now had bad vibes for him. I suggested he bring a big bundle of sacred sage to Bishop and purify that place from the memories of his lost love. He gave a hearty laugh. The senior student in our group was a Washoe tribal member who is finishing her Ph.D. While we worked in the hot sun, screening the debris in a cloud of dust, tribal elders stood close by. I thought I could read in their faces a sense of pride in this new generation of university students reclaiming their culture and helping to heal a wounded place. This entry was posted in Blog and tagged archaeology, Dr. Sarah Cowie, Field Archaeology, Native American, Native American Spirituality, Owens Valley Paiute, Stewart Indian School, University of Nevada at Reno, Washoe I Indians. Bookmark the permalink. Thanks Brad. See you Saturday night. Using sage for cleansing is something I need to remember to do. May we all remember that every item we touch is sacred and spirit charged. Healing the memories of destroyed sacred customs is a task for all of us in every culture. Evangelisation is most successful when it builds on what is there and developing it slowly from within. Patrick did it for Ireland and it took root deeply, using sacred wells, sacred oak trees and mountains as bases;. Mateo Ricci tried for China but imposing European Christian structures hurt the effort. The Hebrew Bible shows that Oak Trees were and mountains were sacred to them and became transforming elements for the patriarchs. The USA and UK destroyed the Middle East by trying to impose economic and cultural patterns and “democracy” on them as new imperial dictators. Thank you for respecting the traditions and for making the field school a place for healing rather than betrayal and destruction. There were some day schools that were conducted with love and respect for the community, but the government shut them down. Sad legacy. I saw the pain of the residential school experience of many of the Lakota whom I encountered on Cheyenne River Reservation in South Dakota. Thanks for honoring the spiritual traditions and making the field station a locus of healing! I saw the devastation of residential schooling in some of the Lakota people whom I encountered on Cheyenne River Reservation in SD. I heard that there were some day schools that were conducted with love and respect for the local community, but that the government closed them. Sad legacy. Thank you for helping to heal old wounds and to preserve the best of the ancient traditions! Father Brad, your experiences come alive here…thank you for sharing. May each person you meet feel the mighty presence of your sacredness.